Wait, What Else Can We Do? What else can we do with programming skills? Once you finish this course and look around, you might find yourself doing something other than programming video games. Your programming probably won't be in Python. In fact, you might not realize you've got an opportunity to do programming at all. In this chapter we'll look at different examples of what you can do with your programming skills. Even if you don't become a full-time programmer, you can save yourself a lot of time and effort by creating some small programs on the side that keep you from doing repetitive tasks. It used to be that combining programming skills with electronics to control robotics was difficult. Creating embedded systems that combine a small cheap computer that can manage servos, valves, motors, and lights required a very different type of programming. Embedded systems often don't even have an operating system like Microsoft Windows. They might not even have a disk drive! In the last few years programming embedded systems has become so easy that even some grade school kids are doing it. 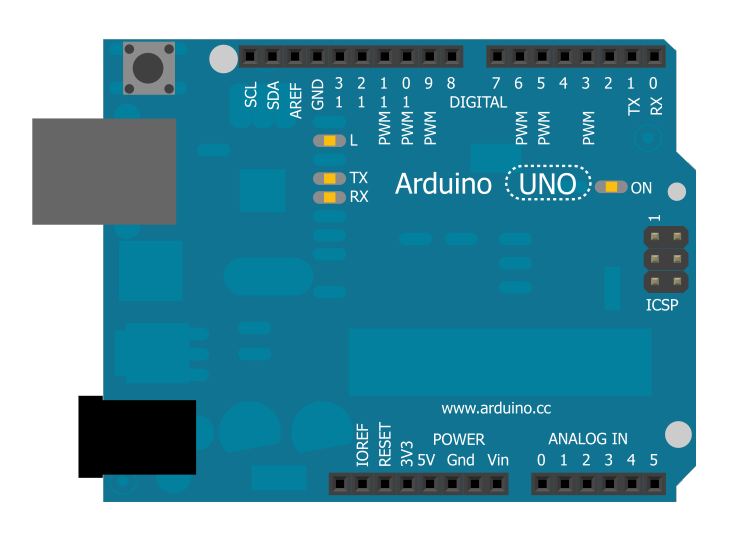 One of the products helping this new movement of do-it-yourselfers is the Arduino. The specifications for the Arduino are free and open, allowing anyone to create their own embedded solutions for very little money. There are many other companies that sell Arduino kits. If you have a good Radio Shack in your neighborhood, it may have a selection of Arduino computers. Adafruit (one of my favorite companies) sells an excellent starter pack with an Arduino computer, some lights, a motor, a servo, and a few other odds and ends can be purchased for various companies for less than $100. This experimenter's package can be used to build the following Arduino example that controls nine LED lights, one multi-color LED light, and uses a force sensor to control a servo arm. 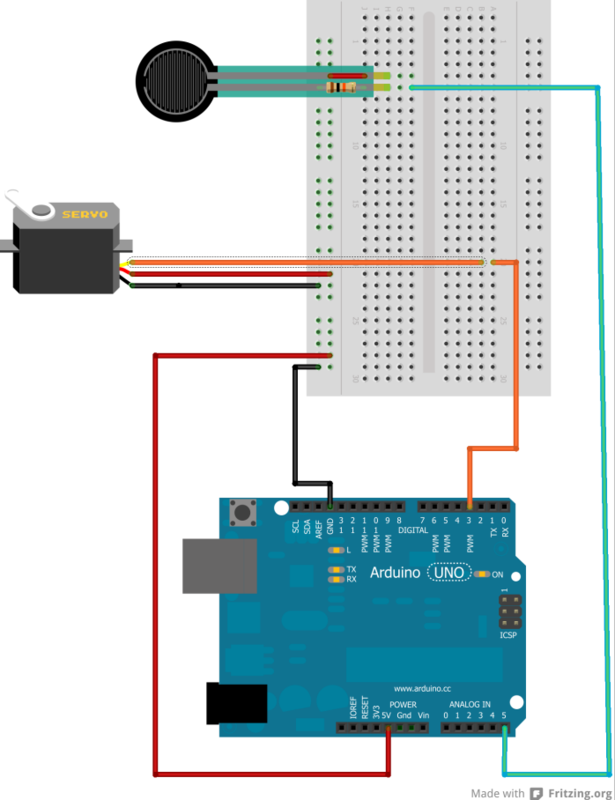 Figure 47.16 shows how to hook up one LED light to the Arduino. The LED hooks up to pin 13 on the Arduino. A “resistor” is also placed in-line to keep the electricity from flowing too fast and burning out the LED. Resistors have different values, and the color codes on the resistor allow a person to select the correct resistor. This setup for pin 13 is repeated for pins 13 down to 4, so that a total of 9 LEDs can be hooked up to the Arduino. If you don't want to be stuck with only one color of LED, you can use a multi-color LED. Multi-color LEDs have three LEDs built into them. One for red, one blue, and one green. Sound familiar? Colors are specified for the LED by controlling how bright red, green, and blue are. This is just like programming our game! Hooking up the multi-colored LED is shown in Figure 47.17. Figure 47.18 shows how to hook up a force sensor to control how far a servo arm moves. The force sensor is very sensitive, and based on how gently it is squeezed, the robotic servo arm can do your work. A little more work and you can create your own exoskeleton! Instead of using import to bring in a library, C uses #include. C uses curly braces rather than indentation to determine what goes in a loop, function, or conditional statement. In the example setup is a function definition, just as Python has function definitions. Rather than what type of data you want in a variable, C requires you to explicitly state that you are creating a new variable, and what data it will store. For example, int r creates a new variable r that holds an integer number. The Arduino has a setup function that has code similar to what we'd put before the main program loop in our Python games. 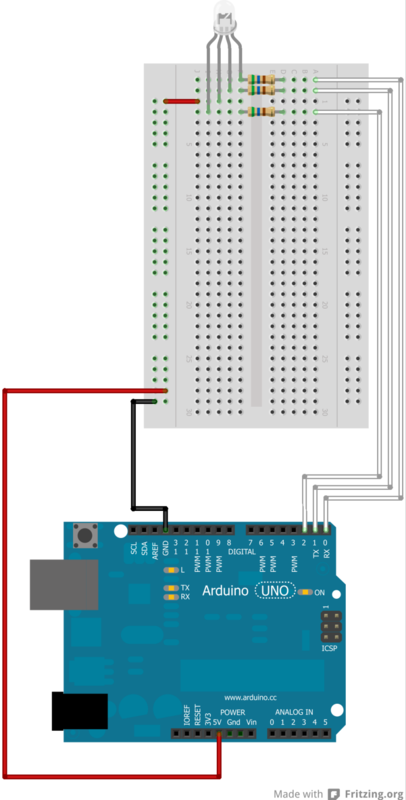 The Arduino has a loop function that is called over and over. The code in here is the type of code that would go in our main program loop for Python. As you can see, there are also random number functions in C.
The for loop in C looks different than Python, but the concept is the same. C also has if statements and uses == to test for equality. Imagine you graduate from college and start work in the business world. A nightmare! You weren't hired as a VP! You are a lowly peon in the business world set to do menial tasks for someone else. This isn't at all like what the college brochure promised you. You have to create the same charts, over and over for some financial analyst. He makes too much money to be stuck creating charts, so you have your first job creating these charts for him in Excel. We have to import data from the web. We have to chart the data. We'll have to create 10 of these charts every day for different data sets. Now just about any job could need to do this. That data could be anything. In this case, we'll use stock data. Great, our job is boring. Error prone. And takes way too long. Particularly if you want to make the charts look fancy. But wait, we took Professor Craven's programming class. Let's try that. Too bad we program Excel using Visual Basic, and Dr. Craven taught us Python. Ah well, let's not worry about details like that. We'll create an Excel program that creates new stock charts from internet data. Open the Excel program. I'm using the 2010 version here. 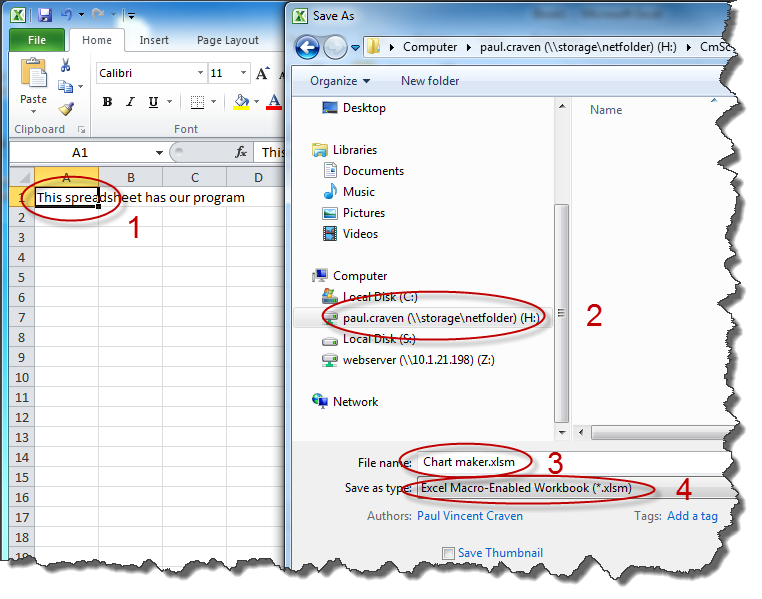 Type in first cell “This spreadsheet has our program.” This will make it obvious which spreadsheet has our program, and which spreadsheets have the charts. 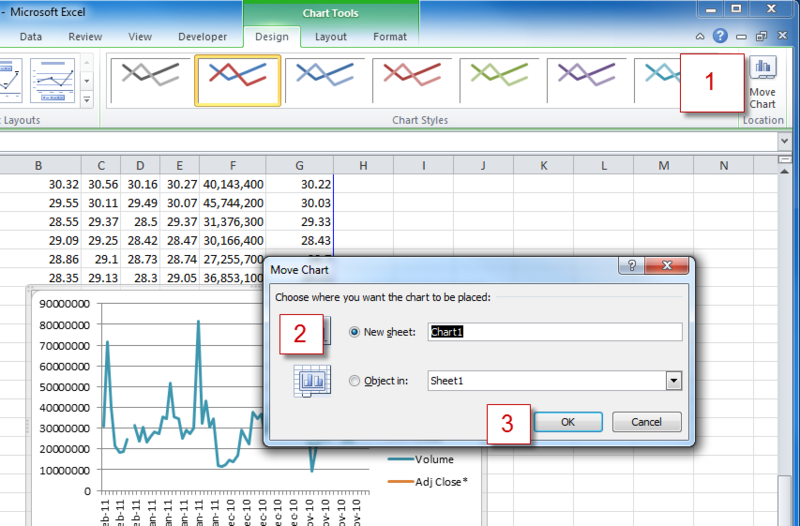 Save this file and title it “chart maker” Important: Make sure to save as a Macro workbook! Otherwise your macro won't run. See Figure 47.19. Name the macro CreateChart, see Figure 47.21. You can't use a space in the name, because this is a function and has teh same rules Python has. 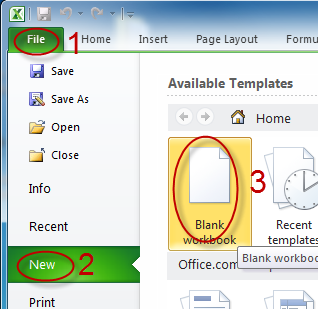 File tab...New...Blank workbook. See Figure 47.22. Select the table we are interested in, and import. See Figure 47.23. Select the cells we want to chart. Do this by using the keyboard: ctrl-shift-left, then ctrl-shift-down, then up one. 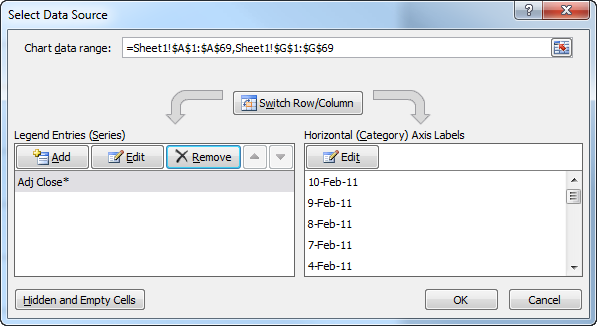 Insert tab...Line Chart. See Figure 47.24. 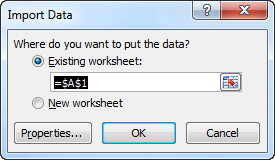 Select the option to move to a new worksheet. See Figure 47.25. 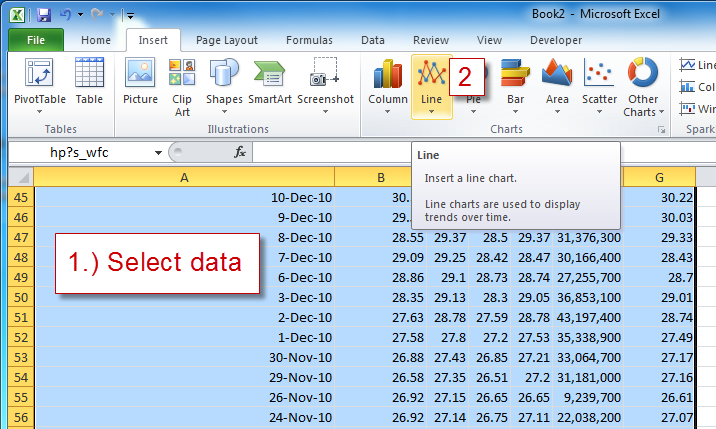 Right click on chart, “select data.” See Figure 47.26. 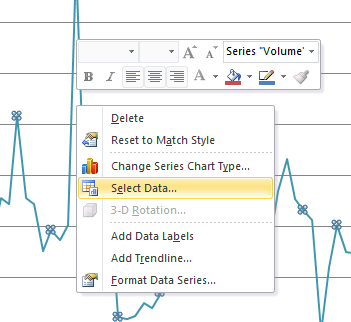 Modify the data so you only graph adjusted close. See Figure 47.27. Change the chart title to something better. 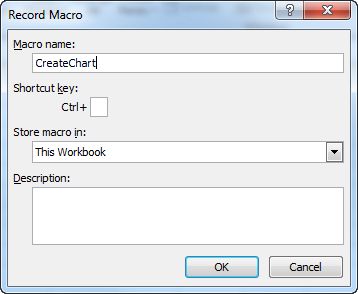 Run the chart maker macro from the macro menu item. Cool! It creates a chart, but what does this have to do with what we studied? Where's the code? Glad you asked. Rather than play the macro, click edit. Note first line. Sub is short for subroutine. Which is another name for function/method. Look, Workbooks.Add, a function to add a workbook! Look at the parameters! Booleans! Objects! What happens if we change the Ticker? Cool! What if we could have a variable represent the ticker? Ok, so what if we could make this into a function where we pass in the URL? See Figure 47.29.